We've gushed about Mike Evans's ability to get physical before, but that was mainly focusing on him pushing defenders around as he ran routes. 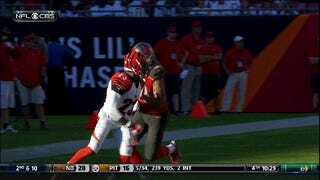 Here's Evans using his muscle to take down Bengals corner Terence Newman in today's game. The 6-foot-5 Evans has about 30 lb. on the 5-foot-10 Newman. This meeting was doomed from the start.